Anybody know what wires are the signal from the deck. 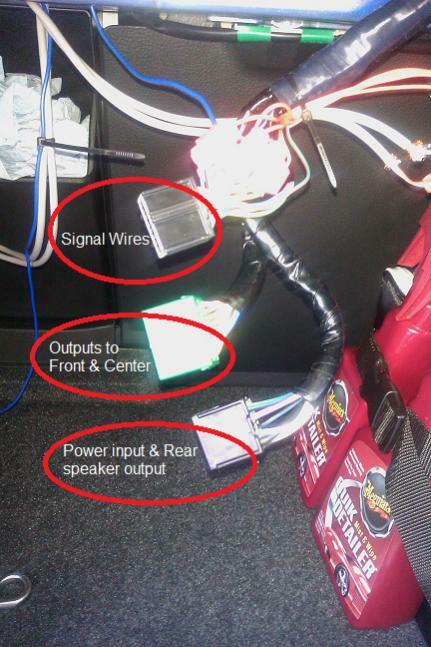 There is 3 plugs going into the rear amp on my 2010 r3 with the bose setup. The wires don't look anything like ones the guy from the series 1 forum. Ran power to the battery along the drivers side door sill. grounded to the bolt for the rear seat thats under the seat bottom. I connected the signal wires directly to the low level inputs (not speaker level) via RCA jack to the amp. Tapped the Pink/Black-stripe and ran that to the turn on. Works correctly and no funny business when you turn on the AudioPilot or Centerpoint features. The plug closest to the back seats has all the signals for the speakers from the headunit. This includes both front and rear and the center speakers. The front and rear are bundled into 4 wire shielded cable and the center channel has its own 2 wire shielded cable. There are some other wires in this plug that I did not identify but I believe they may be part of the audiopilot and centerpoint features. The middle plug has the wires for the front speakers and the center speaker outputs. Adding a sub to the bose system definitely makes the system much better overall. No need for two 12s or two 10s just a single 10 with about 400watts RMS is good. Also to note after removing the negative terminal the TCS and DSC will be disabled until you move the steering wheel all the way to the left and to the right. I did this with the engine off so no power assist. yeah i'll take some pictures later today when it's daylight. I swear its a family car! Glad I ran across this thread now. I just bought my 2009 R3 yesterday and noticed that the Bose in this car is not as round as my Nissan. I thought the previous owner might have replaced some components or messed something up. Sounds like a sub is gonna be the way I wanna go. Anyone figured out The middle plug wires??? I connected The blue Black and blue white to external amp and Only left tweeter worked. Have I lost my mind? Bose system w/o door amps?